Cooking | Oh, hello thirty. When I was visiting Louisiana earlier this month I had the opportunity to raid my friend Sarah’s mom’s recipe file. Let me tell you, it was a fantastic pilfering. Among other things, she had an incredible collection of homemade healthy salad dressings. Last night I tried her Balsamic Strawberry Dressing and it was out of this world. Even better? It was extremely simple. 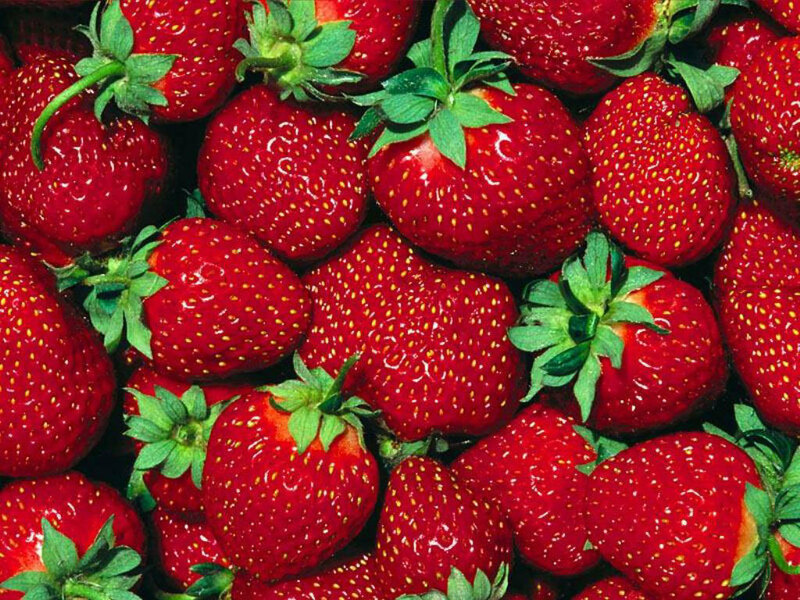 You just chop up a couple of cups of strawberries and toss them with some balsamic vinegar and sugar. After an hour or so you have a delicious dressing. I tossed it with spinach, feta and some pecans for a refreshing salad. Today for lunch I will be adding a little shredded chicken and enjoying it all over again. I also have a sneaking suspicion that you could dump a few tablespoons of the strawberries over vanilla ice cream and have an outstanding dessert. Put in container and shake or stir. Let sit at least an hour. Serve over spinach with cheese (feta, blue, goat) and nuts (pecans, walnuts, almonds) or try over ice cream! *You can cut the recipe in half if you aren’t making salad for a group. I like to have extra in the fridge to play with for a few days. Our Sunday Night Supper club met for the second time yesterday. To avoid conflicts with the Oscars we got together during the early afternoon, the ideal time for a late brunch. Our club operates as a potluck, the hostess is in charge of the main dish and beverages and the remaining ladies bring dishes that compliment the main event. Yesterday’s smorgasbord featured a basil quiche, arugula salad, ginger glazed sausages, Tuscan lemon and zucchini chocolate muffins, West Virginian pizza rolls, ginger fruit salad and, my contribution, a zucchini-pineapple bread. The zucchini-pineapple bread was absolutely scrumptious. Dense, moist and perfectly sweet. It definitely earned a permanent spot in my recipe file. I’m trying to be more rigorous about not wasting ingredients, so Andrew and I enjoyed zucchini-potato pancakes with eggs for dinner. It was an easy, healthy meal, perfect for a Sunday night. 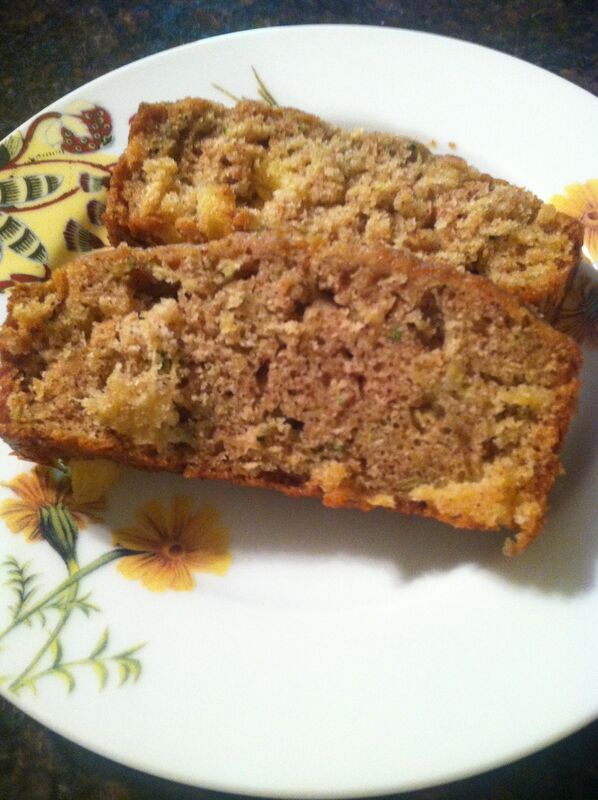 We may have spoiled the healthiness a bit by indulging in a heaping serving of zucchini-pineapple bread for dessert. Hey, we have to use up the leftovers somehow! Lightly spoon flour into dry measuring cups, and level with a knife. Combine flour, salt, and next 3 ingredients (through ground cinnamon) in a large bowl, stirring well with a whisk. Beat eggs with a mixer at medium speed until foamy. Add sugar, zucchini, oil, egg substitute, and vanilla, beating until well blended. Add zucchini mixture to flour mixture, stirring just until moist. Fold in pineapple. Spoon batter into 2 (9 x 5–inch) loaf pans coated with baking spray. Bake at 325° for 50 minutes to 1 hour or until a wooden pick inserted in center comes out clean. * Cool 10 minutes in pans on a wire rack; remove from pans. Cool completely on wire rack. This recipe makes 2 loaves. Freeze the extra loaf, tightly wrapped in plastic wrap and heavy-duty aluminum foil, for up to one month. Thaw at room temperature. Slices are good microwaved at HIGH for 10 to 15 seconds. *After 8 years of baking in temperamental NYC rental apartment ovens I have learned to always vigorously underestimate the baking time. It’s better to check the oven every two minutes for the last ten minutes of baking then wind up with burnt goodies. 1 T mixed herbs – either Italian herbs or other mixes you have in your cabinet. I used an herbs and garlic mix I have from a Puerto Rican spice store. Shred zucchini and peeled potato using a food processor with a grating attachment. If you don’t have a food processor you can shred using a micro-plan zester/grater. You can also purchase the potatoes already shredded (just look for refrigerated hashbrowns), but I figure if you are already shredding the zucchini why not shred the potato and save a few bucks. Heat a large nonstick skillet over medium heat; heavily coat pan with cooking spray. Using the 1/4 cup measuring cup that you measured with create 8 patties. 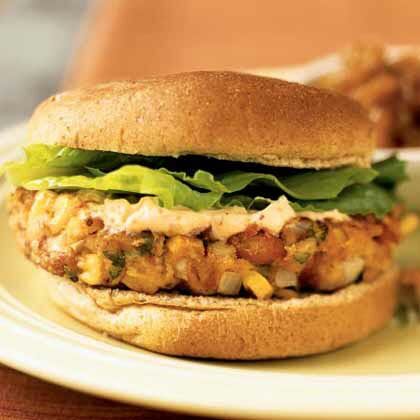 Form the patties with your hands so that they stick together. Place patties in pan. Cook 5 minutes; turn and cook 4 minutes or until potato is tender. Remove pancakes from pan, and keep warm. If necessary, repeat procedure with remaining potato mixture. Reheat pan over medium-high heat; heavily recoat pan with cooking spray. Crack 4 eggs into pan; sprinkle with 1/8 teaspoon black pepper, and coat tops of eggs with cooking spray. Cover and cook 3 minutes or until whites have just set and yolks begin to thicken but are not hard or until desired degree of doneness. 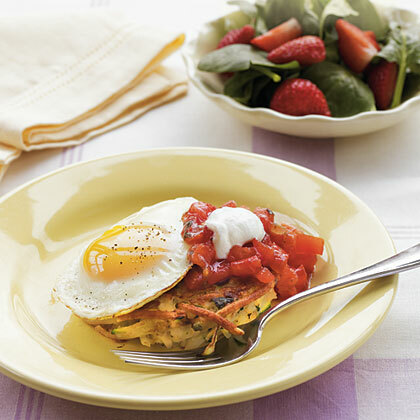 Slide 1 egg onto 2 potato pancakes. Serve with salsa and sour cream, if desired. Getting dinner on the table in our household is sometimes a challenge. Despite the fact that I love to cook, weeknight meal preparation often feels more like a chore than an enjoyable pastime. New York’s endless take-out options also make it far too easy to be lazy, and let’s be honest, a bit unhealthy. I find that making dinner happen is a lot easier if I think ahead and carefully choose my recipes. I have three main requirements for a weeknight dinner. First, it most be delicious. I really don’t see the point in bothering with mediocre food. Andrew and I rate every new recipe I try. If a dish doesn’t score at least an 8 out of 10 it doesn’t enter regular rotation. Second, it must be quick and easy. Ideally I am in and out of the kitchen in under 45 minutes, leaving plenty of time in my evening for watching cheesy television. Third, it makes good leftovers. Andrew takes his lunch to work most days and I work from home. Eating leftovers for lunch helps keep our food budget in check and ensures that most of our meals are relatively healthy. 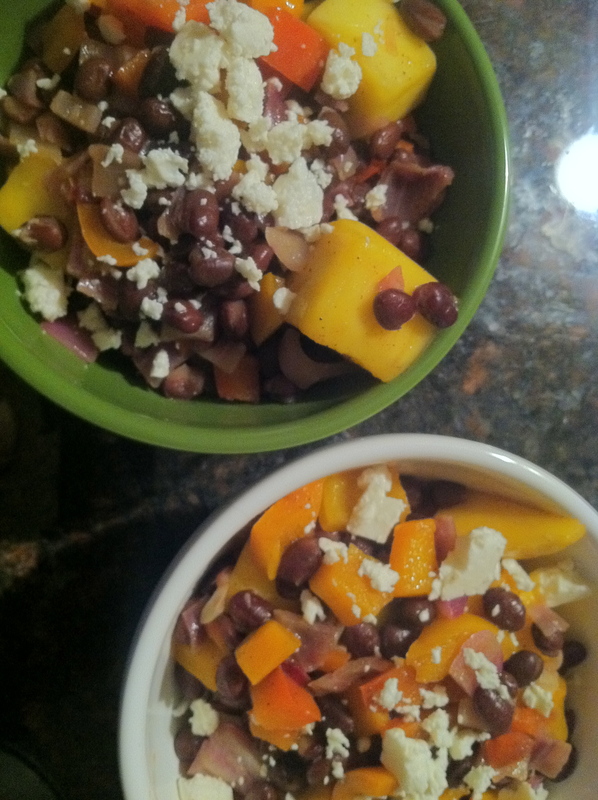 Tropical Black Beans with Coconut Rice passes all three tests with flying colors. Prepping and cooking takes about half-an-hour, the final product is absolutely delicious and it tastes just as good the next day. I highly recommend adding this to your week-night menu. 1 1/2 cup chopped bell pepper (I use red, orange or yellow – about 1 1/2 full peppers) You can use pre-chopped peppers to save time. Add bell pepper, onion and garlic. Sauté 4 minutes or until tender. Stir in mango, juice, spices and beans. Cook 3-4 minutes or until thoroughly heated. Combine coconut milk and salt in a 2-quart saucepan. Bring to a boil; gradually stir in rice. Cover, reduce heat, and simmer 10 minutes or until liquid is absorbed and rice is tender. Remove from heat; let stand, covered 5 minutes. Fluff with a fork. Stir in hot sauce and green onions. If you don’t have instant rice on hand you can make this with normal brown rice. I follow the instructions on the package, subbing coconut milk + broth or water for the amount of liquid required. *We are not regular OJ drinkers and I can’t stand buying a big jug of juice just for one recipe. Instead I keep a tub of frozen concentrate in my freezer, either in tupperware or in the the original packaging covered with plastic wrap. When a recipe calls for fresh juice I sub in frozen – I just scoop it right out of the tub and into the pot. Just make sure to add a little less than the recipe calls for since the frozen stuff is more concentrated. I haven’t always liked to cook. In fact, I didn’t have a clue about what to do in the kitchen until I was 23. I was a 2nd year law student living in NYC with a tiny apartment kitchen. I’m not sure what I’d been subsisting on – probably a combination of take-out and frozen foods. I don’t remember what changed but I suddenly decided one day that “Grown-Ups” should know how to cook so I bought a few cookbooks. I started with an old family favorite – the Better Homes & Garden Cook Book. My Mom’s battered red and white checkered edition has been in my house longer than I’ve been alive. I jazzed it up a bit with the new Pink Plaid breast-cancer edition. 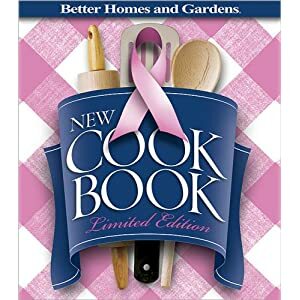 Cooking and a cause? Perfect. Like the good type-A girl that I pretend not to be, I didn’t just casually start cooking. Nope. I made a plan. It was simple. I cooked twice a week, one day I would make an old standby, the other I would cook something new. Luckily, my Mom and my best college girlfriend both happen to be fabulous home cooks, so I always had someone to call when I had questions. I highly recommend this method for anyone just beginning in the kitchen. 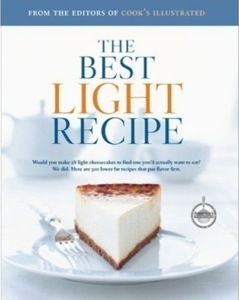 It helped me build my confidence gradually and it was great to have a few recipes that I knew I could execute perfectly. Within a few months I’d discovered that not only could I cook, but I loved to cook. There was no turning back. Cooking with my beautiful Mom! It’s funny how social circles can change so gradually you hardly notice. A few years ago my NYC life was filled to the brim with acquaintances and a heaping handful of good friends. Then, one by one, they moved on to new adventures in different cities. Luckily they’ve ran off to exciting places like NOLA, San Diego and LA so I always have somewhere warm to visit. However, over the last six months I’ve found myself, more than occasionally, feeling a little lonely. Don’t get me wrong. In the friends department I’m incredibly lucky. I’ve been super blessed with tons of amazing ladies, both in NYC and around the country. But I’ve been jonesing for some additional quality girly hang out time and some new faces for my circle.